A three roll mill is a machine tool that uses the shear force created by three horizontally positioned rolls rotating at opposite directions and different speeds relative to each other to mix, refine, disperse, or homogenize viscous materials fed into it. We have over 23 successful years manufacturing three roll mills which have been selling worldwide. Our lower manufacturing cost savings are directly passed on to You - our valued customer. The "STD" Series provides performance that meets or exceeds that of much larger production models. 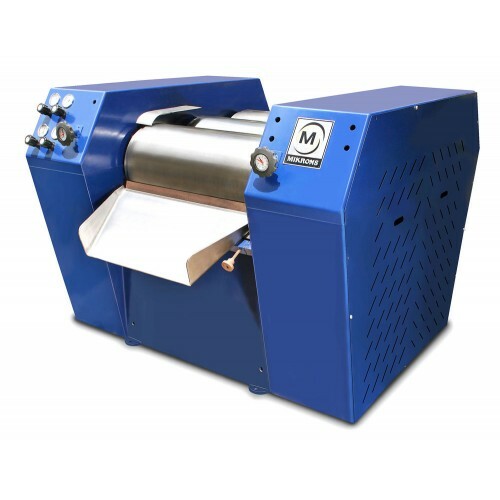 The unique tensioning system of the "STD" Series minimizes the free play in the roller ball bearings ensuring a more constant gap and ultimately a finer, more uniform particle size in the product. And the gap is easily set with a single hand wheel for parallel roller adjustment to 3-5 microns at its closest setting. The roller tensioning system and constant gap make it possible to use a variety of materials for the rollers. "HVM" Series is designed for more than just the standard product. When particle size, consistency and wetness are a problem due to the viscous or sticky nature of the product, the " HVM " Series can dramatically improve results. Or, if greater capacity is needed for less troublesome materials, the HVM can provide the same high production quality in bigger batches. 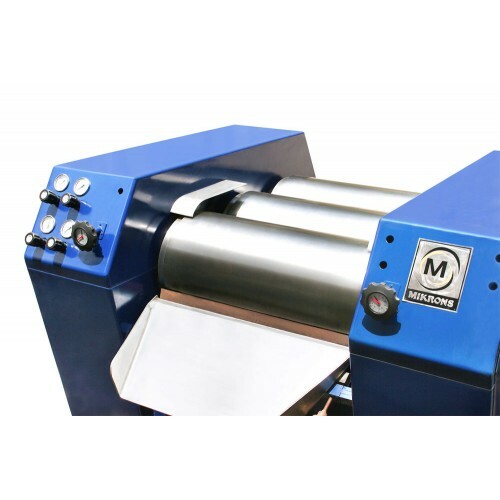 The " HVM " models come with the same roller tensioning system for maintaining a constant gap as in the case of our other TRM models, and same roller and scraper blade materials are available. The larger diameter rollers also provide more shear force during processing. 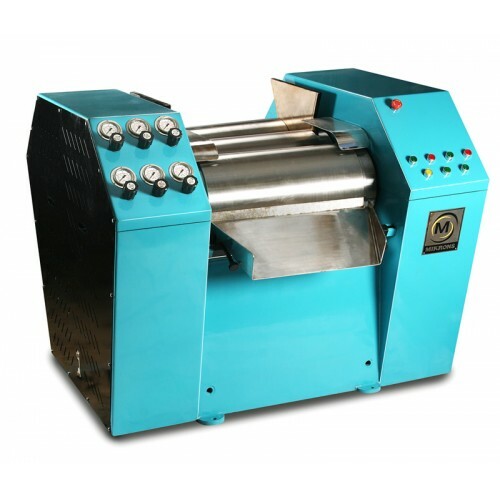 And, since more force can generate more heat in the product, our machines are provided with heating/cooling system for the rollers. The "S" Series provides performance that meets or exceeds that of much larger production models.The unique tensioning system of the "S" Series minimizes the free play in the roller ball bearings ensuring a more constant gap and ultimately a finer, more uniform particle size in the product. And the gap is easily set with a single hand wheel for parallel roller adjustment to 3-5 microns at its closest setting. The roller tensioning system and constant gap make it possible to use a variety of materials for the rollers. Glass coatings, Dental composites, Pigment, Coatings, Adhesives, Sealants and foods.